With online banking, automatic bill pay and electronic account management it’s easy to manage your financial life digitally. Except when it comes to paying your taxes, a task which still requires quite a bit of physical documentation. When working with this type of sensitive financial information it’s important to make sure you store and dispose of these documents responsibly to reduce your risk of fraud. With tax season upon us, chances are you’ve been collecting and organizing an entire year’s worth of financial documentation. Here are some tips to help ensure you store and dispose of your documents safely. As a general rule, the IRS recommends keeping copies of your tax returns forever. As for the supporting documentation that goes with each return (like W-2’s), there’s a general statute of limitations that allows the IRS to audit your tax return up to 3 years after you file it. Once the 3 year period has expired, you can securely discard the documents. There are a few exceptions to this rule, so check out the IRS’s website for complete details. Now that you know what to keep, it’s best to store your financial documents in a fire-proof safe. It would also be smart to keep other important documents like your birth certificate, social security card, the deed to your house, important passwords and banking information in here too. 1. This Fire-Safe Chest is smaller and a perfect “starter safe”. It can store a few important documents and USB drives. 2. If you have several years’ worth of information to store, consider the Sentry Safe Combination Safe. It’s a little bigger and can accommodate more papers. 3. For maximum security, this Executive Fire Safe offers ample storage, is water and fire proof and can even be bolted to the floor. When the time comes to get rid of some documents, make sure you do it responsibly. 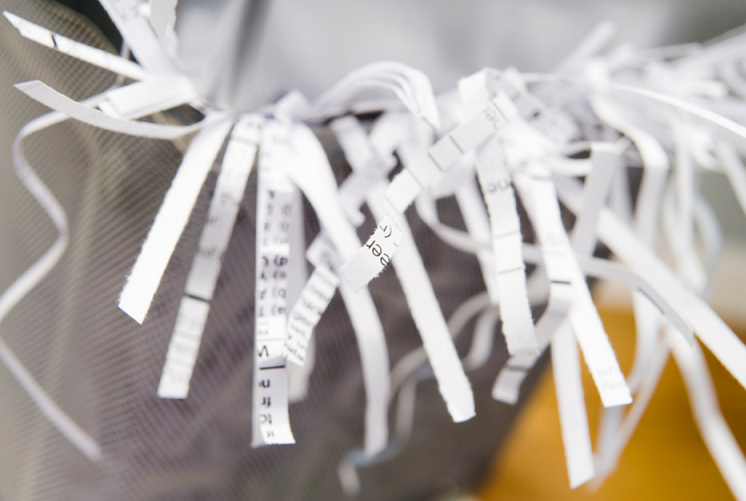 Simply tossing this paperwork in the trash makes you vulnerable to fraud, and identity thieves would love to get their hands on all your personal and financial information. To make it harder for this to land in the wrong hands, it’s always a good idea to shred the sensitive documents. 1. The Ativa 12-Sheet Cross-Cut Shredder shreds up to 12 sheets of paper at a time and can also destroy credit cards. This would be great if you’re just destroying a few documents at a time. 2. For bigger jobs check out the Fellows Cross-Cut Shredder. Itis perfect for household use and has a 5-gallon wastebasket so you’re not constantly emptying it. 3. If you’ve got a big job to tackle or anticipate shredding often, the Swingline Stack and Shred may be worth the investment. It can shred up to 100 pages at a time and runs automatically so you don’t have to feed the sheets in individually. Use this tax season to get your files organized. Use these tips to responsibly dispose of what you can, and safely store the rest. And don’t forget, tax day is April 15!